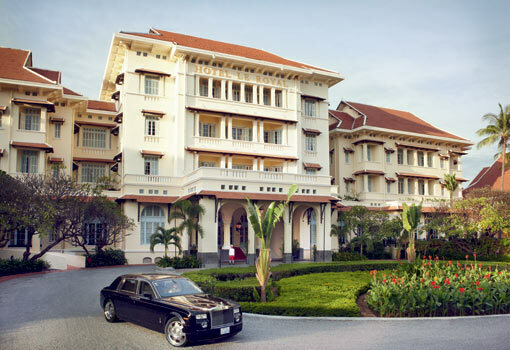 Raffles Hotel Le Royal not only appeals to the finicky elite of the world, it is also the choice of another tough crowd to please, business travelers. No request is too big or too small for this world-class property, and whatever it is, it is delivered with smiles and graciousness. Amenities are part of what sets this hotel apart from the rest, whether it is the interesting swimming pool, the rejuvenating health spa, or the exercise options presented in their attractive gym. And dining here is a treat not to be missed. The premises are spotlessly clean throughout and styled in a colonial theme with thoroughly modern facilities. It is a safe bet that most guests do not have at home such elegant bathtubs as this Raffles, making the art of hygiene a luxury more than an obligation. The rooms here are large, many with great views, and superbly furnished with everything the pickiest jet-setter and demanding business traveler could possibly want, even if they bring their kids. This property is very family friendly and the pool has a special section for youngsters to play. Dining is an integral part of any travel arrangements and guests rave about the cuisine offered up in the romantic Raffles dining room. Everywhere you go in the hotel you are greeted with smiles and a polite hello, sometimes with your name attached. The entire staff is professionally trained and fluent in English. Pop in the elegant Elephant Bar before or after dinner for a relaxing cocktail or wine spritzer and enjoy the camaraderie the ambience encourages. You feel a sense of history from the moment you arrive and walk up to the front desk and feel as though you are part of an interesting past. Your registration is attended to by a butler while you savor a complimentary welcome juice cocktail. If you want to take the historical experience up a notch, book the Jackie Kennedy Suite or the Charles DeGaulle Suite for your stay and indulge in breathing the same air of these legendary personalities. You will love starting your days at the sumptuous breakfast buffet before heading out to the fairways and greens for some Phnom Penh golf to satisy your competitive or recreational nature.